A book, part of The Page and the Screen, Did You Get the L? We’re pleased to announce the publication of The Binder and the Server, an expanded and illustrated paperback version of the essay by the same name, which originally appeared in the winter 2011 issue of Art Journal. 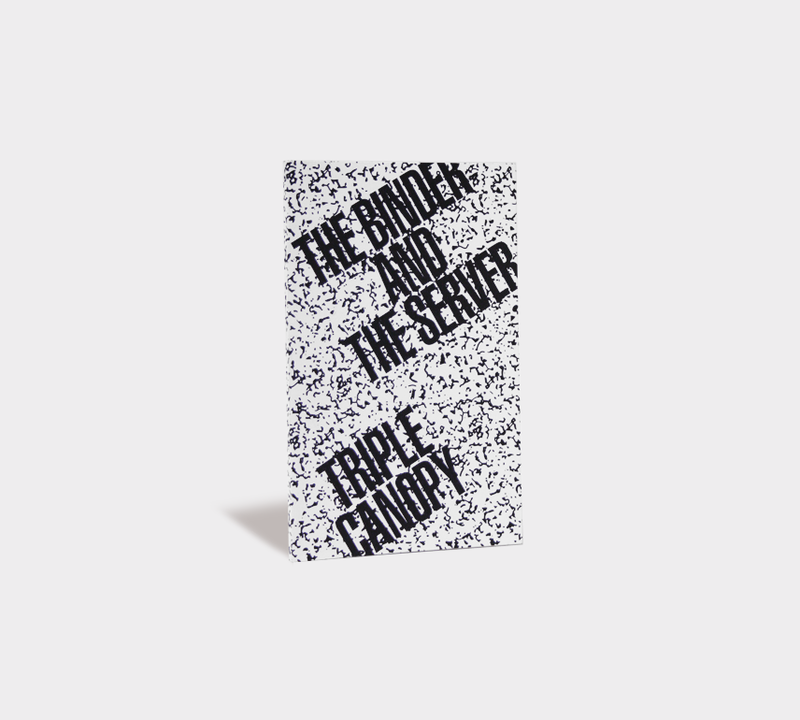 The Binder and the Server is the outcome of several group discussions among Triple Canopy editors, and was written by senior editor Colby Chamberlain. The essay details the history of Triple Canopy in order to stake out our position on the ideology of Internet culture. By carefully examining the history of new-media publishing and the shift from disciplinary to control societies, the essay addresses the politics of online identity, friendship, labor, and the dream of digital democracy. In short: On the Internet, we are all contractors. This pocket-sized edition of The Binder and the Server, designed by Franklin Vandiver, draws on experimental paperbacks of the 1960s, chief among them the collaborations of Marshall McLuhan and graphic designer Quentin Fiore. The book is characterized by cinematic layouts that merge text, typography, illustration, photography, and original artwork by Josh Kline and Dan Torop. The Binder and the Server expanded paperback was published with generous support from Franklin Street Works Press. In March, at the annual College Art Association conference, “The Binder and the Server” received the Art Journal Award for the most distinguished contribution to the journal in the past year.